Yes, it’s still a smidge green, but it’s more of a gray green, and really, we had to figure out a color that would look good with the countertops AND our new cabinets. Oh? I’ve not mentioned those yet, have I? Oh yes. Prior to Jimmy, the Husband and I were just going to strip the doors that were already there, slap on some white paint and find new hardware in the hopes that would help the wonky doors look better. But NOW, we’ve gone a bit more grand. 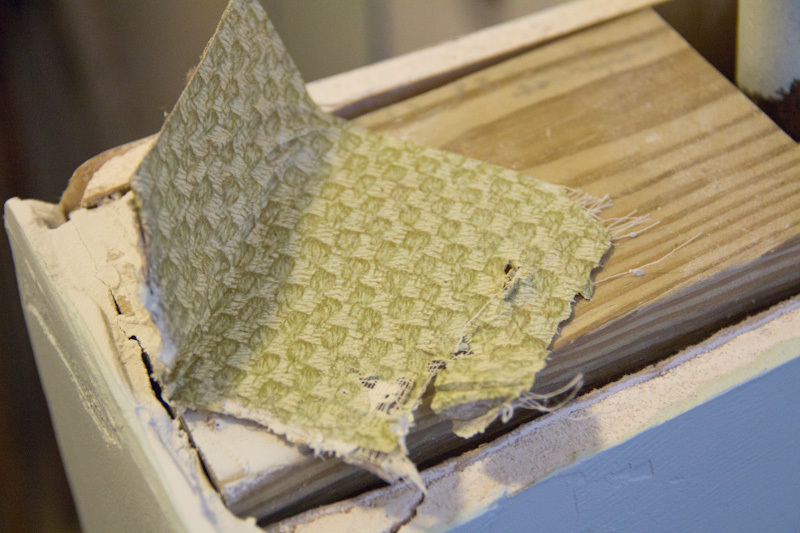 The cabinets will truly be receiving a new face, new doors and new drawers – complete with smooth tracks that don’t create wood shavings on my pots and pans below. We’ve had to get crafty with our painting perches. 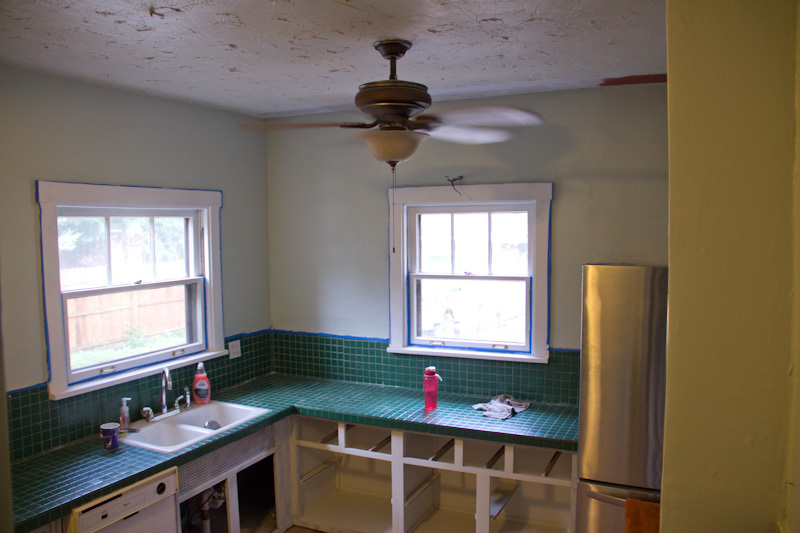 This kitchen has LOTS of trim work to tackle. 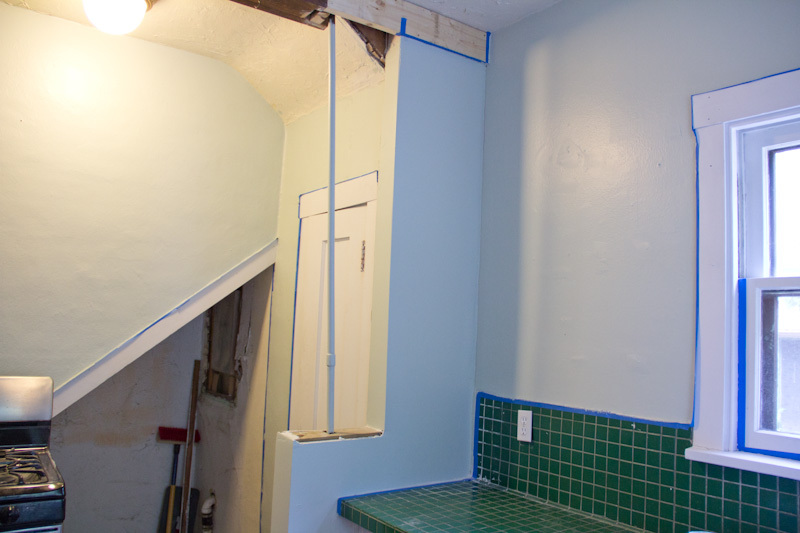 Once the new color had been slapped on the walls and dried, Jimmy came back over and began working his magic. He was both shocked and completely dumbfounded by our dishwasher. 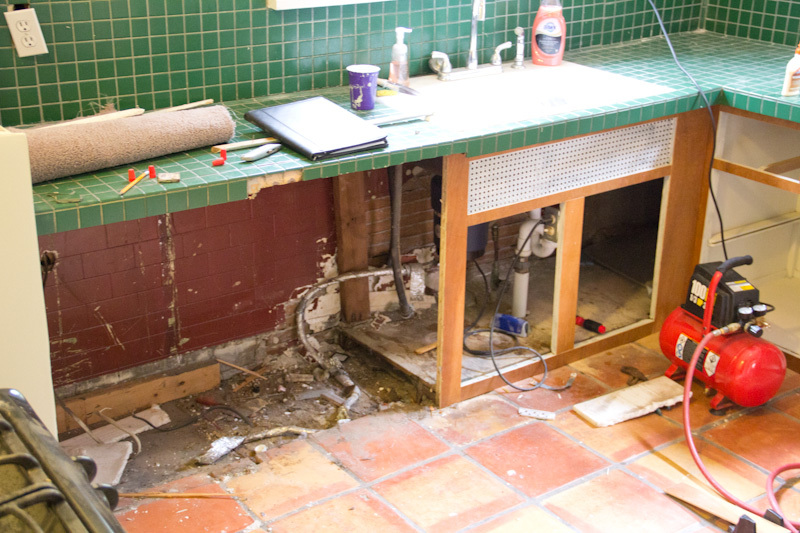 We’d never replaced it because we assumed it had been cemented in when the owners in the 70’s decided pouring a concrete tile floor was the way to go. When Jimmy first wiggled the dishwasher around he didn’t think it’d be too hard. . .then he began to realize what we’d come to learn over the past four years. The owners who “renovated” the kitchen were bleepin’ bleeps [please insert the most accurate adjectives that come to mind]. We have now confirmed our suspicion (and Jimmy is just shaking his head in only the wtf way you can), the cabinets and dishwasher were, indeed, cemented in. 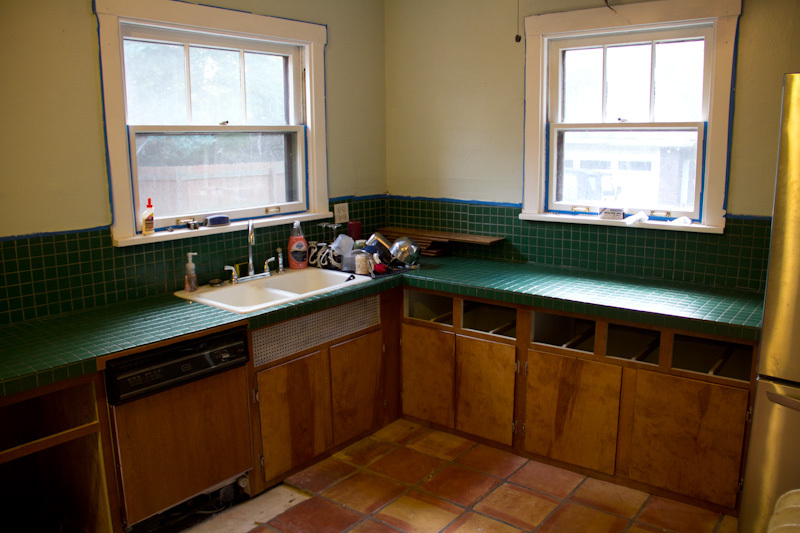 Not only that, but they also covered the baseboards in the kitchen – half are under cement & a built up platform/floor and the other half are what you see. 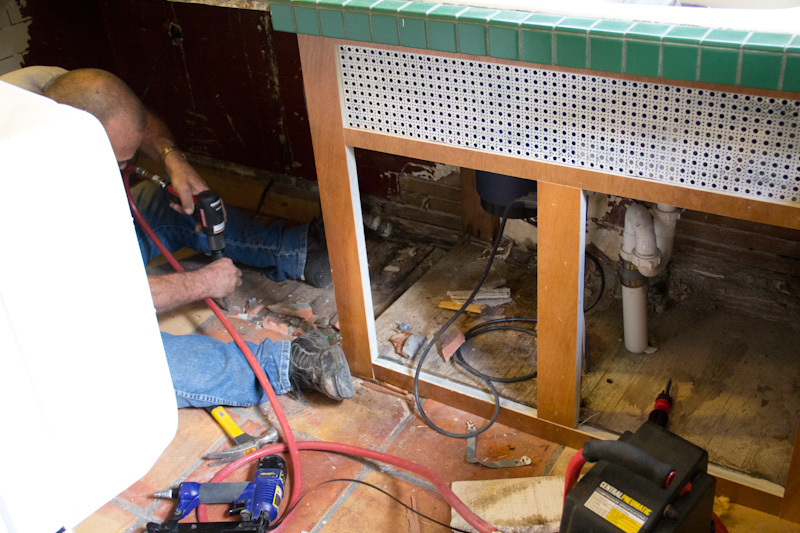 We then assume that we have a final bottom step leading into our kitchen that also remains under the current floor. 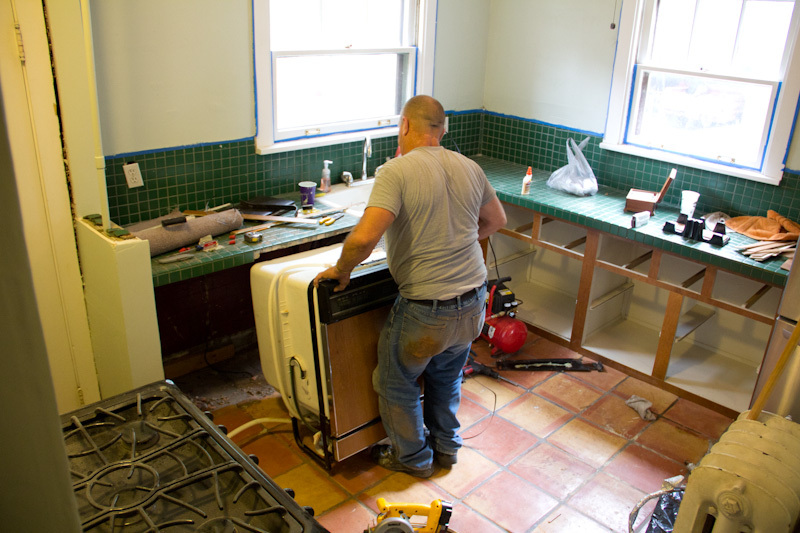 That all confirmed, Jimmy, sounding a little defeated, let us know he was going to have to figure out a way to remove a tile or two in order to get the new dishwasher in. Oh no worries. Thanks to the Husband’s ever-thoughtful father, we had a pneumatic chisel to the ready. Bam. Tile out. 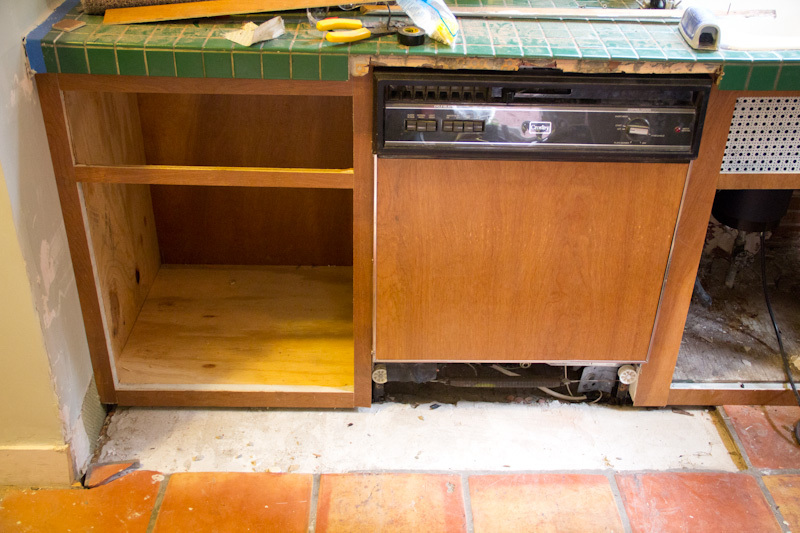 That thing was the key to kitchen success – Jimmy popped in our rather retro looking dishwasher, complete with matching woodwork, into place and immediately got to work on re-creating the cabinet to it’s side. It’s predecessor was far from straight, missing sides, back and bottom and really, kinda worthless as a cabinet. It has a bottom too, but after wrestling with it all of it, he determined waiting on hooking it up may be necessary for his own recovery. So now, our kitchen is beginning to take on that new kitchen smell. Really, it smells a bit like freshly sawed wood, new paint, with a whiff of varnish. 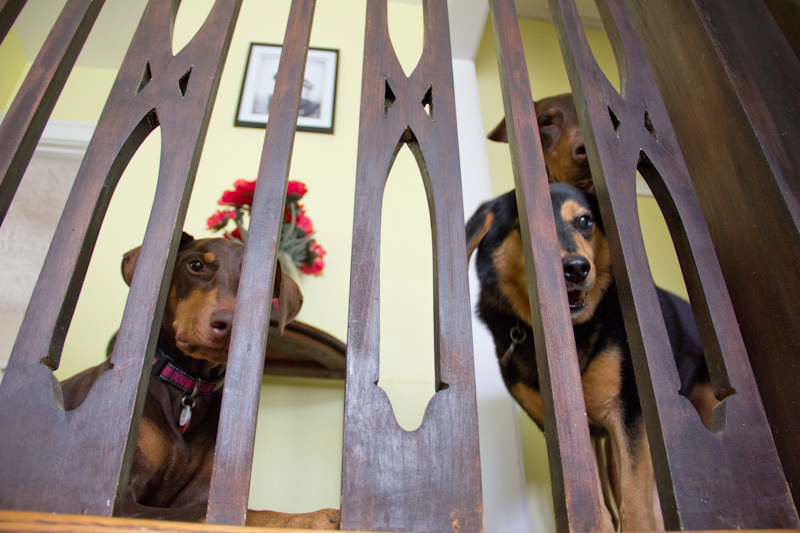 The pups have not approved of their upstairs restriction during this process… but it’s almost there, almost. Another encouraging thing from this adventure – taking up the floor will be easier than we first imagined, when we get there. It’s like an archeological dig, isn’t it? Already it’s worth the sore muscles and broken nails. Kudos and power on! You guys are awesome! Awaiting he big reveal. It is! I’m still waiting for that buried treasure that’s gonna pay for the whole darn thing… but until then, this works. Ha! I believe those are THOSE cups. ;o) I love plastic cups for such trimming projects.